Making chicken nuggets at home means you can choose healthy ingredients. High in fiber and protein, coconut flour is a gluten-free alternative that you can use to make a coating for moist and tender chicken nuggets. Because this flour is made from the dried and defatted meat of the coconut, adding coconut flakes to the breading will bring out the natural sweetness in the flour. While baking with coconut flour requires an adjustment of the wet ingredients, using an egg wash before rolling the chicken in the flour keeps your nuggets moist. Line a large plate with one or two layers of paper towels. Have a second, unlined plate ready. Spoon coconut flour, seasoning and dried coconut, if desired, into a zip-top bag. Choose a bag with no holes in it. Shake the bag to combine the flour with the seasonings and set aside. Cut the raw chicken meat into bite-sized chunks using a sharp knife. Wash your hands thoroughly after handling the raw meat before touching any other ingredients. Leave the cut chicken on the cutting board. Whisk eggs in a small bowl with a fork and set them in a convenient spot, next to the cutting board with the prepared meat. Thin the egg wash with milk, broth or water, if desired. Dip each chicken chunk into the egg batter and hold the piece over the bowl so the excess egg drips off. Drop the piece of chicken into the zip-top bag and repeat. Do not overfill the bag. Divide your meat into two or three batches so the bag does not get overcrowded. Shake the bag until all the meat pieces are lightly coated with the coconut flour and seasonings. Remove the chicken pieces from the bag and lay them carefully on the unlined plate. Let the coated pieces rest a few minutes undisturbed to bind the coating. Drop the floured nuggets into a hot skillet filled with 1 inch of oil. Cook on medium-low to medium heat. Add more oil as needed so the chicken pieces brown without burning. 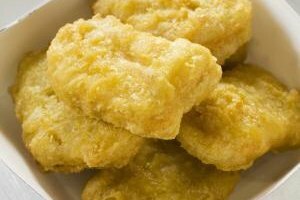 Flip the chicken nuggets using your kitchen tongs after 1 to 2 minutes of cooking, or when the edges are lightly browned. When both sides of the nuggets are nicely browned, lift them out with your tongs and place the meat onto the prepared plate that has been lined with the paper towels. Serve while hot with your favorite dipping sauces. Coconut flour can dry up pretty quickly, and it also has a tendency to clump. 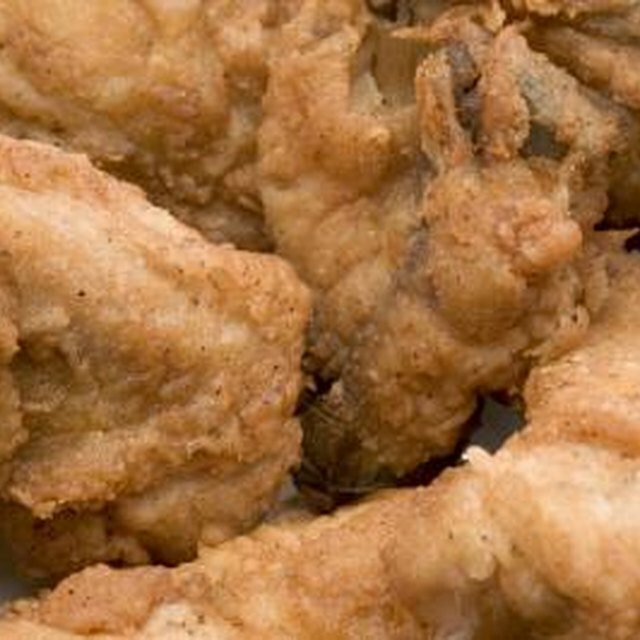 The egg batter helps keep the chicken moist, but watch the nuggets when they're browning so they don’t dry out. It's better to have too much flour coating than run out in the middle of cooking. Aim for 1 to 1 1/2 cups of flour per pound of chicken meat. Blending coconut flour with other flour helps reduce the clumping and adds variation to the texture. Try corn flour, brown rice flour or almond flour. Raw and uncooked meat can cause foodborne illness if not handled properly. Wash hands, utensils and cutting boards that come into contact with raw poultry before touching other ingredients to avoid cross-contamination. Throw away any unused coconut flour left in in the zip-top bag. Fully cooked chicken has no pink in its center. The Kitchn: Coconut Flour Is the Best Gluten-Free Flour? How Do I Make Baked Boneless Chicken Wings?